I may not practice it as much as I’d like to, and I’m nowhere near my desired “Yogi” status (lol) but the relaxation my mind and body feel after a Yoga class is like nothing else in the world. Honestly. That’s why every time I get a chance to experience a new Yoga class, I take it. Over the weekend, I was invited by the super fun & creative Rosie of The Hustling Mama to join a group of mommy bloggers at a yoga class with the Parallel Method. The Parallel Method is a wellness company created by local mom, Angie Poston. It offers classes through a system of “smart scheduling” which basically means that parents and children get to enjoy independent play simultaneously (hence the company’s use of the word Parallel in its title). The fee for a drop-in class is $29 which includes 1.5 hours of childcare for one child (more on this in a bit) and 1 hour of yoga for the parent. 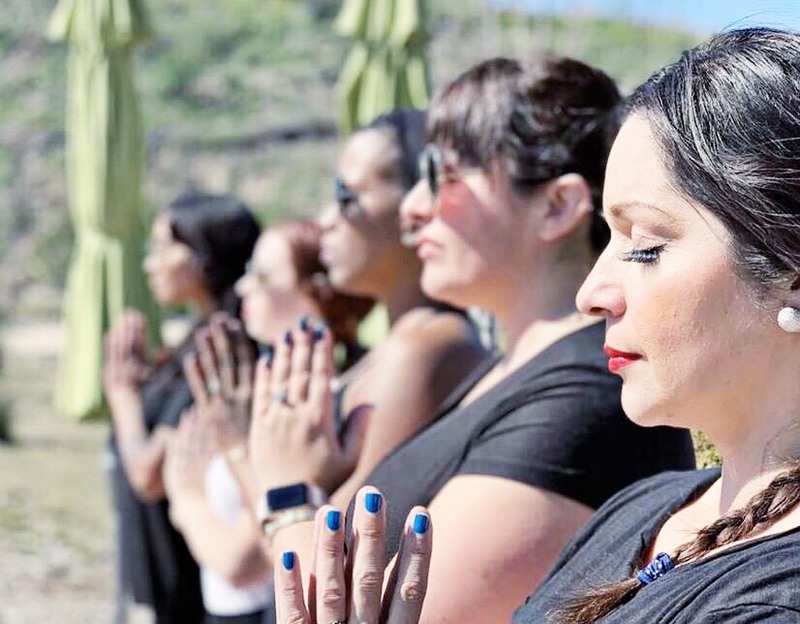 Moms enjoy an outdoor yoga class, surrounded by nature while the children are entertained indoors with enriching activities such as arts & crafts, music and dancing. Kids’ classes are offered by children entertainment companies such as Baila Baila for Kids and others. It’s a fabulous way to give your yoga practice an opportunity to meet with nature and remain relatively close to the kiddos. 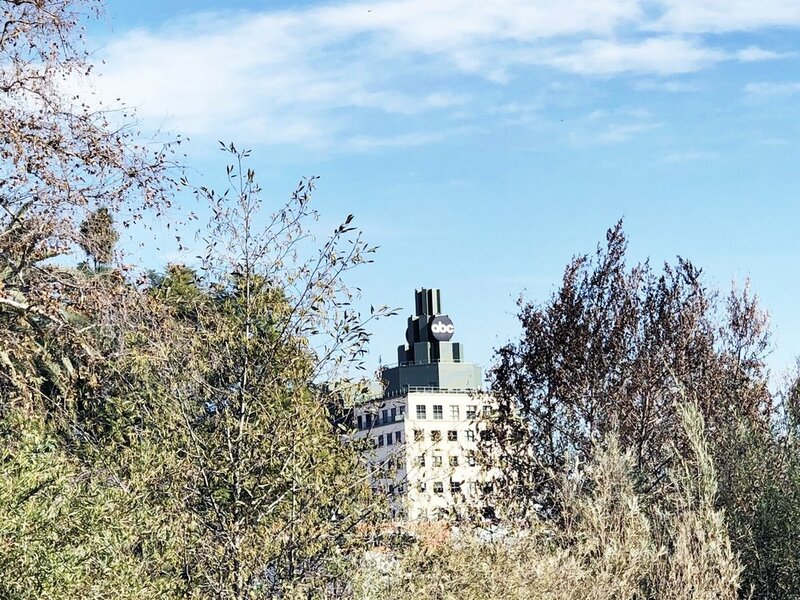 The Stoneview Nature Center is a public space— an urban sanctuary managed by the L.A. Department of Parks and Recreation which has lovely landscaping and gorgeous views of Los Angeles. On days when the skies are clear, you can see the Downtown L.A. skyline from up there. It was my second class at The Parallel Method. The first time I was there, I was joined by a few of my mommy magazine contributors. At that time, Toby, who is super attached to me, refused to play indoors. Instead, he opted to be close to Mama and sat there quietly next to me. I remember feeling his sweet little energy as I lay with my eyes closed, facing up for Savasanah (corpse pose). was similar in that Toby still wanted to be close to me but this time he wanted to participate. He helped our Yoga Instructor, Angie Rutan, distribute yoga blocks by passing them out to the moms. He would go back for more. Eventually, he ran out of women to given them to but wouldn’t leave (lol…Aweee)! to delicious goodies, courtesy of Trader Joes and GoGo Squeez. Snacks included tangerines, water, yogurt and even gluten-free cupcakes…yum! The moms got an extra special gift—a 2019 Harmony Planner created by local mom (and full-time attorney) Kellie Beach Sims. Thanks, Kellie! I look forward to using my planner! A special thanks to Rosie for organizing this wonderful experience and to Angie from The Parallel Method for hosting us. It’s a colorful shop located at at 11740 San Vincente Blvd. When kids walk in, they’re welcomed by a mini playground equipped with a slide and all— perfect to keep them entertained while they wait their turn. There are currently three other Cookie Cutters’ Salons in the greater L.A. area but this is the first to open in the City of Los Angeles…yay! The owners have plans to continue expanding the franchise throughout SoCal including opening shops in Thousand Oaks and Ventura. we arrived and well, the indoor playground was the boys’ first stop! Next to the slide, there are buckets of animal crackers, balloons and lollipops that serve as post-haircut treats for the little ones. from race cars to firetrucks and airplanes – as well as individual televisions for the kids to watch shows and movies. And if you’re a video game fan like Benny, there are video games available too! First-ever haircuts for toddlers receive a special commemorative package with photo and hair clipping….so cute! We expected to be there for at least an hour considering how squirmy Toby can be and because weekends tend to be busy for places like these (or so I thought). But the salon runs a very organized appointment operation! Cookie Cutters Los Angeles never felt too crowded or overwhelming while we were there. As for Toby, I’ll start by sharing that he didn’t initially want to board his plane at his haircut station. He first wanted to climb the firetruck in the back of the salon (which serves as a shampoo station for kids). LOL! Leti, his hairdresser started trimming away. She was very gracious and Toby didn’t complain a single time! Friends, both haircuts were completed in half hour! We almost wanted to hang out there a little longer. Monday through Friday from 10:00 a.m. to 6:00 p.m.; Saturday from 9:30 a.m. to 5:00 p.m.; and Sunday from 11:00 a.m. to 4:00 p.m.
For more information or to book an appointment, clients can: visit online, call (310) 914-9095 or download the Cookie Cutters Haircuts for Kids mobile app available for iOS and Android. We now know have a new favorite place to visit when the boys need a trim! 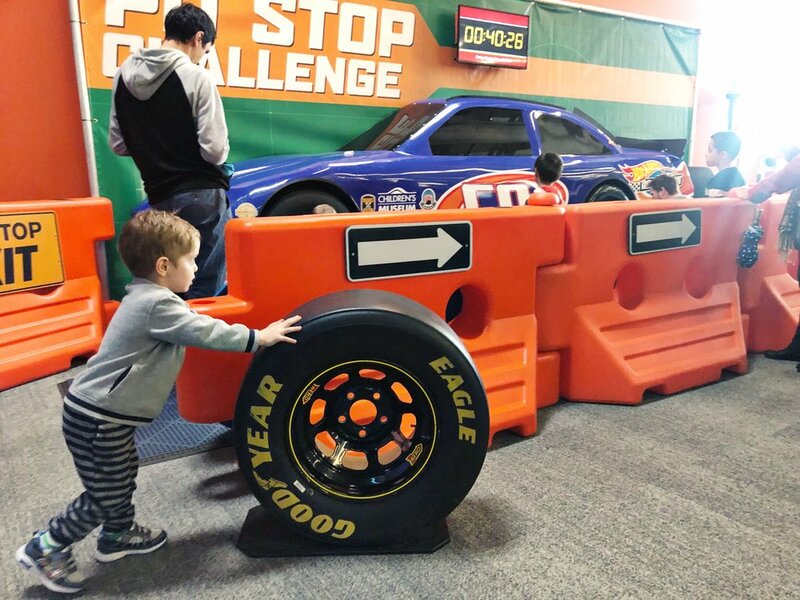 Friends, the Discovery Cube L.A., located in Sylmar recently opened its new exhibit— Hot Wheels™: Race to Win™. We ended up at the museum on Superbowl Sunday after having spent all day home on Saturday. Now, I’m not sure if you guys understand what staying home FOR AN ENTIRE DAY means when you live in a house full of boys. But we were All. Going. Crazy. The rain kept us indoors but when Sunday arrived, there was no way I’d be doing that again… so we took off to the nearest kids’ museum we could find. It was the Discovery Cube L.A.
with immersive activities. The displays are meant to help visitors learn about the science, technology, engineering, and math that goes into making cars go faster. My car-lovin’ sons had a blast racing tiny cars, playing mechanic and even pretending to be race car drivers. There’s a Pit Stop Challenge that allows kids to “change tires" and refuel the car. A 6 lane downhill speed track, booster power track, adjustable angles track, and timing track are also available for play. Did you know Hot Wheels were introduced by Mattel in 1968? The "tricked-out" toy cars have come a long way (both in the die-cast and life-size varieties) with more than 800 models and 11,000 variations of Hot Wheels car creations. More than 4 billion Hot Wheels die-cast cars have been sold. That’s because Benny and Toby made their way to the museum shop and swore they were on a shopping spree… Fortunately, we all agreed we had visited the Discovery Cube to get out of the house and play, not shop! All this to say, the shop is full of really cool Hot Wheels gifts. get busy and rowdy on weekends with dozens of kids looking to enjoy the same experience. Just make sure to pack a jar full of patience and arrive with a game plan to keep an eye on your little ones while you’re there. There’s a lot of running around, car chasing and everyone seems revved up…lol! enjoyed other fun Discovery Cube exhibits and headed home in time for Super Bowl 53! The Hot Wheels exhibition will be on display through April 28, 2019 before it continues on its tour throughout North America. For more information and tickets, click here. Tucked between film studios, the 134 FWY and Providence St. Joseph Medical Center, sits a little park named the Johnny Carson Park. by the Burbank City Council to the King of Late Night for “30 years of keeping America up late and laughing”. We once saw Angelina Jolie’s kids playing here (they were with a nanny) and we’ve returned every so often wondering if we’ll encounter another celebrity kid sighting…lol. Not only does it feature an awesome & interactive playground for kids, there are exercise stations throughout the park, a jogging trail, a Space Shuttle Columbia Memorial and plenty of information stands. The information stands explain the extensive habitat restoration that was completed to allow Burbank residents and visitors to breathe fresh air and get exercise in a more natural environment. Nina Irene was in town so she was left in charge of watching the boys. Toby is currently going through a major shark obsession. This means he wears his shark helmet everywhere he goes… not a bad deal considering he loves going down slides belly down and head first! Spent most of his time recruiting friends to play a Nerf-gun fueled game of humans versus zombies. 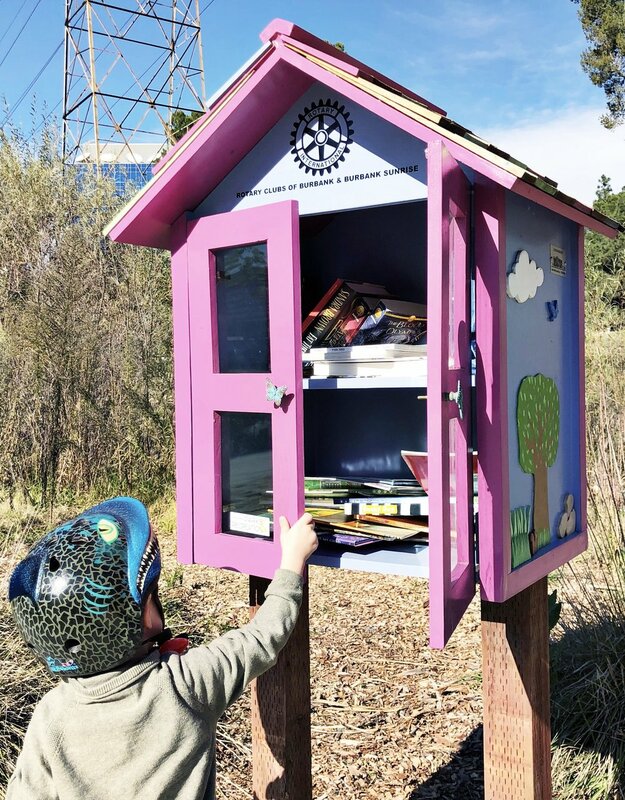 The Johnny Carson Park has a small book deposit shaped like a small pink house, where kids are encouraged to borrow, exchange, drop off or take books and enjoy. This is sponsored by the Burbank Rotary Club. read them while we’re there and return them for other kids to enjoy. It’s nice because you can sit on the lush green lawn overseeing the playground and read to your little ones to change the pace of the play date. We gave each other a high-five. This was, after all, how we agreed to spend time in 2019— in great open-air spaces where the kids can play and we can workout. Did you know Knott’s Berry Farm has a program where they offer SoCal Fire Department and Law Enforcement personnel free admission for two? It’s pretty awesome considering theme park tickets are averaging about $100 per person these days. because in order to do so, Paul has to be there to show his badge. Since he had a years-long stretch of working weekends, it was impossible to take advantage of his free passes. I had already taken Benny to Knotts… but tackling a theme park with two boys is quite a task so Toby had never visited. Now that Paul’s schedule changed, we decided it was time to take the kids to meet Snoopy! For starters, parking at Knotts Berry Farm is $20, no exceptions. We also purchased two meal plans for about $36 each. For each meal plan purchased you get a bracelet to be worn throughout the day. The meal plan basically entitles each meal plan bracelet holder to unlimited meals at select locations throughout the park on the day of your visit. HOWEVER, you must wait 90 minutes between each meal purchase and the meal plans don’t include drinks or dessert….grrr. Based on our experience, I would probably not buy the meal plan again. I just feel it gave us a weird inclination to make the most of our purchase by using the plan as much as possible when we were there. Every 90 minutes Paul claimed he was hungry again and there we were, standing in long food lines which is definitely not my style! were delicious. The holiday churro form the Churro Factory was also to.die.for! The ribs are served with corn on the cob or a baked potato. The churros are served plain, with special holiday trimmings or you can opt for a famous Churro Sundae. Knott’s Wild West-themed area called “Ghost Town” which we loved! Benny and Toby had a blast trying out a number of guns, rifles and western-themed attractions & shops. We enjoyed Camp Snoopy the most. Benny and Toby got on a few kiddie rides. We also checked out the Knotts Berry Farm arcade and watched the Cowboy stunt show which was funny and at times hilarious (spoiler alert: front row guests get splashed with water numerous times throughout the show). Snoopy was accompanied by Woodstock and we used the photo area for a mini family photo shoot. A fun time for the fam bam indeed. Maybe we’ll see you at Knott’s Merry (or Berry) Farm soon! Chevy Bolt EV: Our First Electric Vehicle Experience in L.A! I’ll be honest friends, I had never given Electric Vehicles much thought. Just the idea of operating one seemed inconvenient. But when a Cajun Red Tintcoat Chevy Bolt Electric Vehicle (EV) arrived at my house and my 2-year old Toby looked at it with an excited smile, I literally started warming up to the idea. This was my chance to see what the Electric Vehicle buzz was all about and possibly dismantle some misconceptions. For this post, I partnered with Chevrolet! The car manufacturer debuted the Chevy Bolt Electric Vehicle (EV) concept in 2015. Three years later, the front-motor, five-door all electric hatchback is the only plug-in electric car with a manufacturer’s suggested retail price of less than $50K (more on that in a bit) and it’s capable of delivering an EPA-rated range of 238 miles. Electric vehicles ARE a thing of the future and NO, it’s not too early to take a chance! For starters, the Chevy Bolt EV is a smart car. By plugging in your smartphone, the vehicle integrates your phone’s apps into an easy-to-navigate screen where you can answer phone calls, listen to your music lists and even get driving directions using voice commands or with a simple tap on the screen. The car provides a smooth & quiet drive. I almost felt like I had to double-check that the car was still on. It’s quiet and makes for a very pleasant drive. Most importantly, Electric Vehicles don’t harm the environment. Investing in an Electric Vehicle is probably the best purchase we can make as parents if we want to lead our children into an eco-friendly & sustainable state-of-mind. The U.S. Environmental Protection Agency has said that more than half of the air pollution in the U.S. is caused by mobile sources, primarily automobiles. Why the heck wouldn’t we consider doing something about this alarming reality!? My boys were happy and confortable in the Chevy Bolt EV! A 2019 Chevy Bolt EV, for example, starts at $36K. An earlier year model can be purchased for less than that, which makes it certainly affordable, especially when you eliminate gas expenses. You can get a tax credit for purchasing an Electric Vehicle. The Plug-in Electric Drive Vehicle Credit is the main federal incentive program for electric cars available in the U.S. Under this program, the purchase of a new electric vehicle is eligible for a $7,500 tax credit as long as it meets certain criteria (the Chevy Bolt EV does). You can charge your car at home. Yes, it’s true. The vehicle comes with a charging cable (located in a special compartment under the hatchback’s trunk floor) that plugs directly into a wall outlet. Charging your Chevy Bolt EV from home is a Level 1 Charge. This means it will add about 3-5 miles of range per hour. For a full charge, you’ll need to have the car connected for 50 hours. Note: the higher the charging “level”, the higher the charging power. Level 2 charging stations can be found at restaurants, retail shopping centers and workplaces. This type of charge can add about 25 miles of range per hour. This means, you can leave the car charging while you go about your errands. is the fastest charging system which adds about 90 miles of range in only 30 minutes. This type of charge can also fill the battery to 80% capacity in an hour. Level 3 charging is available at certain places, which can generally be located through a number of apps available for smartphones. Most charging stations don’t require a fee. Those that do only charge a fraction of the national average cost for gasoline. One easy way to find them is by downloading certain apps on your smartphone. Apps like PlugShare, ChargePoint, and the Chevrolet app can actually guide you to your nearest charging station regardless of where you are. Heck, I’ll even say they’re cute & chic! The Chevy Bolt EV changed my perspective on Electric Vehicles. With everything going on in our world, I feel as though an environmentally-friendly car is the new luxury. I loved this car! I certainly recommend the Chevy Bolt EV for anyone who has a daily commute that’s under 200 miles. It’s very easy to drive and provides a comfortable experience that’s also pollution-free! This is a partner post. Chevrolet allowed me the use of a Chevy Bolt EV in exchange for an honest review on this blog. Fun and Inexepensive Halloween Costumes from Goodwill SoCal! There’s still time head to Goodwill SoCal and find a costume that’s unique enough to impress all the generous candy-wielding neighbors! I partnered up with Goodwill Southern California this year ahead of the Halloween season because it made perfect sense: Paul and I are trying to be conscious of our spending, our environment and the ways we choose to give our kids a memorable childhood experience. For nearly a century, they’ve transformed the lives of individuals with disabilities, providing careers that transform lives. At little or no cost, they help businesses hire & retain talent as well as provide e-waste recycling, among other services at highly competitive rates. They enrich communities through donation drive fundraisers. Last year, they hosted 648 donation drives resulting in $924,252 to community partners. Plus, they care for the earth by being “Green since 1916”. In 2017, they diverted more than 100 million pounds of reusable or recyclable goods from landfills. in search for Halloween costumes seemed like a great idea— We’d get to re-purpose previously owned clothes and use our creativity to give Benny and Toby new material for make believe. The Goodwill SoCal store at Fletcher Square is neatly organized, featuring a Halloween Boo-Tique with costumes and clothing items (by the way, there are over 80 Goodwill Southern California stores). When I entered, I was envisioning costumes and accessories to create a fancy family of cats from the Roaring 20s. Later, I started finding pieces that would make for a great Wizard of Oz family costume ensemble or a DC Comics character family. Ultimately, I opted for creative cowboy costumes! I saved a ton of money, considering the huge expense that store-bought Halloween costumes can add up to! Once home, I began preparing Toby’s costume to help him become a Cowboy Mouse, influenced by the Mexican children’s song of the same name. I grew up listening to Ratón Vaquero and my boys love the song too! A pair of cowboy pants (I believe these are from another costume of Toy Story’s Cowgirl Jesse), a lovely red plaid shirt from Zara, a super fun tiny leather fringe vest, a black cowboy hat with a bandana and a toy gun. By the way, the hat and bandana were brand new. Goodwill SoCal also carries new items to help complement the used clothing shopping experience. In terms of the mouse ears, I ordered those online even though I could have probably made them with felt fabric and thin wire. The mouse ears were simply attached to Toby’s cowboy hat to appear as if they were sticking out. The result: A super cute Cowboy Mouse! In the children’s song, the Cowboy Mouse is a blondie who speaks only English and has big feet— in other words, the Cowboy Mouse IS my son Tobias…lol! At first I thought about taking apart this unique fringe outfit and use it to create cowboy chaps. The idea was to have a family of cowboy mice. But as I started looking at the two-piece set, I started imagining the “King of the Wild Frontier”— Davy Crockett. With this idea came the realization that Benny would ask MANY questions about Davy Crockett, which would actually serve as a mini-history lesson. My husband, who is a history major, was happy to answer Benny’s inquiries. In turn, my son was intrigued and happy to play the part in our backyard. I let him borrow a pair of moccasins and ordered a racoon hat. Once everything arrived, it was the most adorable thing to watch him “hunt and gather his next meal”. Overall, shopping at Goodwill Southern California, was a lot of fun, friends. I’m looking forward to working with this cool organization again to offer fun ideas on ways to reuse and recycle stuff. In the meantime, hope you have a Happy Halloween. I spent the first half of my day floating on salty water, by myself, in the dark. at Just Float in Pasadena, which promotes itself as the world’s most advanced float center. 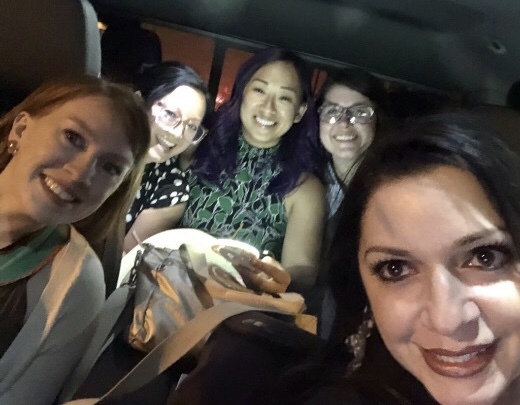 I was invited by a fellow mommy blogger, the lovely Rosie from the Hustling Mama blog, to join a few other mom bloggers and give ourselves a chance to connect and disconnect by experiencing this type of therapy. So what is Float Therapy, you ask? Float Therapy or “Floating” is simply an effortless way to relax. Customers step into a private, oversized tub filled with about 11 inches of warm water that’s saturated with 1,000 pounds of Epsom salt. The result is the same for everyone— you automatically float with no effort required. Because the lights are turned off and outside noise is eliminated, you get to unplug and relax. This kind of therapy was created in the United States in the mid-1950’s by a neuro-scientist named Jonh Lily. Back then, he called the water tubs “Sensory Deprivation Tanks” and through his research, he concluded that Floatation therapy allowed the central nervous system to reduce its workload by as much as 90 percent! is very simple. First you’re encouraged to shower and remove makeup, oils and any other products on your skin. There’s a shower adjacent to each tub, located in individual private rooms. From the shower, you can put on some ear plugs to avoid water entering your ears (plugs are provided) and simply enter the tub, close the door behind you and push the “Begin float” button once you’ve situated yourself in a comfortable floating position. You will be provided with a swim cap that serves as a pillow of sorts. Once your 60 minute session is over, the lights turn back on and that’s your cue to exit the tub, take another shower to wash off the salt (the facility provides shampoo, conditioner and body wash) and head out to the styling station to blow dry your hair or to the relaxation room to enjoy a hot cup of tea. 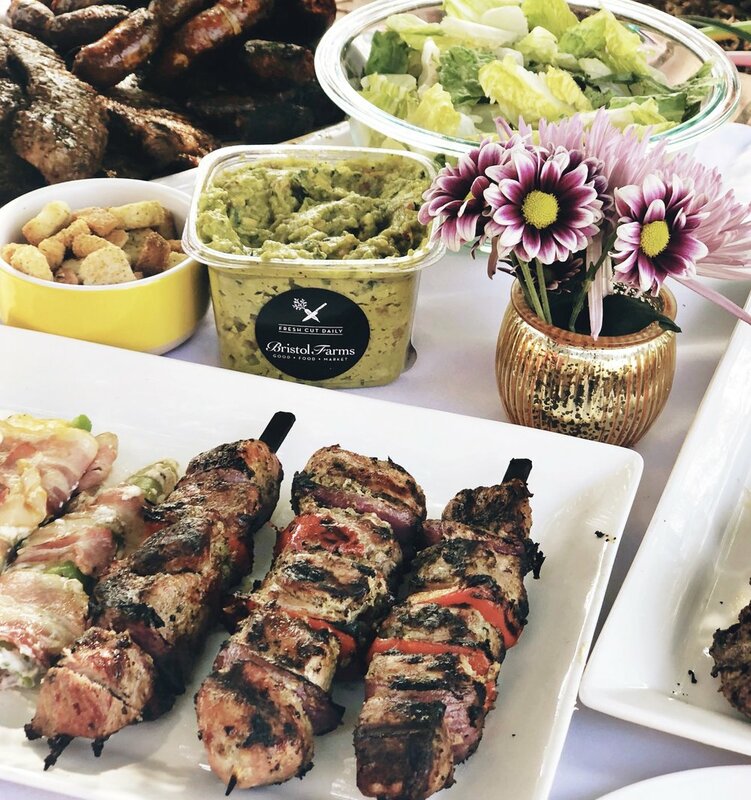 past few months, this mommy blogger meet-up seemed like the perfect treat. And it was! Not only did we get to know each other and bond over stories about our kids, careers and life journeys, we also bonded over how great Float Therapy made us feel. each Float Therapy Session costs approximately $80 although first-time floaters are only charged $60. The session includes 60 minutes of floating, access to complimentary grooming and styling products and water and/or tea. The experience is TOTALLY worth the investment. Once you try it, you’ll be glad you did. Thanks again, Rosie! and thanks to the awesome staff at Just Float for hosting us! My five-year-old son Benny loves to dance. And he’s not embarrassed to bust a move! When I heard about an amazing new dance academy opening its doors in the San Fernando Valley, I decided it was time for Benny take his first Hip Hop class. launched its brand new, 10,000 Sq. Ft. state-of-the art dance studio this summer, promoting a series of themed dance camps for kiddos. Benny is a cartoon buff and immediately gravitated toward the Trolls Hip Hop Dance Camp (for kids ages 6-9). Since Benny loved the hit movie and soundtrack, Trolls seemed like a perfect fit. the sprawling dance studio and were greeted by Benny’s instructor, a bubbly and sleek choreographer with Film, TV and Broadway credentials. After a few fun, interactive and inclusive warm-up exercises, the kids jumped right into the fun! Campers decorated colorful Troll hair (Benny opted for green-colored hair!) and began to learn choreography to their favorite Trolls songs. The classes were short and sweet, running from 8:45am-12:00pm and concluded with fresh organic popsicles, generously provided by the Academy owners, the lovely Maia Suckle and Rhonda Notary. Benny literally couldn’t wait for his next class! the kids performed their new dance moves with an intimate dance presentation. Watching Benny own the dance floor in his own quirky way made me a very proud mommy. I immediately started searching online for his next dance class. offers a great roster of dance classes taught by top-notch choreographers and professional dancers. They offer everything from ballet and tap to ballroom dancing and even Hip Hop for parents. an amazing, creative and high energy dance experience for your kids (or yourself), INDUSTRY DANCE ACADEMY is where it’s at! This is a sponsored post. We received a complimentary dance camp registration for a review on this blog. All opinions are my own. A Futuristic Circus Has Arrived in Downtown L.A. and We Love It! Two Bit Circus is Awesome! Fun for play dates or date nights! The new Two Bit Circus in Downtown L.A. is part retro arcade, part virtual reality center and part circus. It’s quite innovative and offers fun for kids, teens, adults and even senior citizens (we met Granny Potty Mouth there :). It opened at the beginning of August and recently got the blessing from L.A. Mayor Eric Garcetti who described Two Bit Circus as a place where “today's young Angelenos (can) create lasting memories of their own -- and glimpse the future of our city in the process." Benny and I attended a private event this week and had the opportunity to explore 38,000 square feet of games and fun. Millions of dollars were invested to convert this massive warehouse into an “all ages” fun zone in the Arts District. It’s clear where much of the money went— there are numerous state-of-the-art virtual reality experiences available, from bird simulators where you actually lay on a machine belly down and extend your arms to fly — to virtual themed-escape rooms. Nonetheless, there’s also a lot of old-school elements, like pinball machines, a Pac-Man arcade and even Skee Ball stations. There aren’t many attractions for kids under 5, but the place is colorful, spacious and lively enough to entertain the little little ones. is always a winner in my book. I mean, honestly, who doesn’t love the big red top? There is a full-bar at the center of the venue where people can take a seat on carnival horse seats and enjoy a drink. During our event, guests were able to create their own circus name tags. Then a Two Bit Circus employee would add a light using tiny bulbs and real batteries. Benny said his started to get “glitchy” after 10 minutes but that’s probably because he wouldn’t stop running from one experience to the next. They include the Arcane Arcade, which is where Benny and I spent the most time. Just think new-age, multiplayer digital games, together with old arcade cabinets of yesteryear... too fun! Our second favorite zone was the Midway, a nostalgic carnival game area of chance and skill, re-imagined with modern technology. For example, there’s a balloon dart game, where players throw plastic balls, instead of darts, at a digital screen to pop balloon images (think Toy Story Midway Mania at Disney California Adventure). This area is just amazine. It’s a zone showcasing the best in modern mixed reality. There is multiplayer seated Virtual Reality with haptic platforms, four-player standing Virtual Reality, and the world-renowned Birdly flying Virtual Reality attraction I mentioned earlier. There are several kid-friendly (non-violent) experiences too. I would have seen in action but didn’t, is a drink machine called Gearmo del Pouro. It’s apparently a giant robot bar that makes drinks and pours them for guests, without the help of a human bartender… Hopefully next time! Two Bit Circus is open daily from 4pm to 11pm. Fridays and Saturdays close at 1am. If your kids are too young, you should plan a date night here. I couldn’t help but imagine how much fun I’ll have with Paul next time we go! Admission is free but you should budget about $40 per person if you want to maximize your Virtual Reality experience and have drinks and dinner. You can probably get away with $25 if you eat before you arrive and stick to the more traditional games. The FUNBOX is a Colorful Pop-Up in Thousand Oaks! Friends, we found this place by accident. It’s located inside the Thousand Oaks Mall, on the second floor. It’s called The FunBox and coming from someone who’s gone to many colorful Instagram emporiums and interactive Pop-Up museums in Los Angeles, I feel this one is certainly up there in terms of design, execution and overall happy vibes. that will be open through October 31. Tickets are $17 for adults and $12 for kids ages 5 and over. Kids under 4 are free. 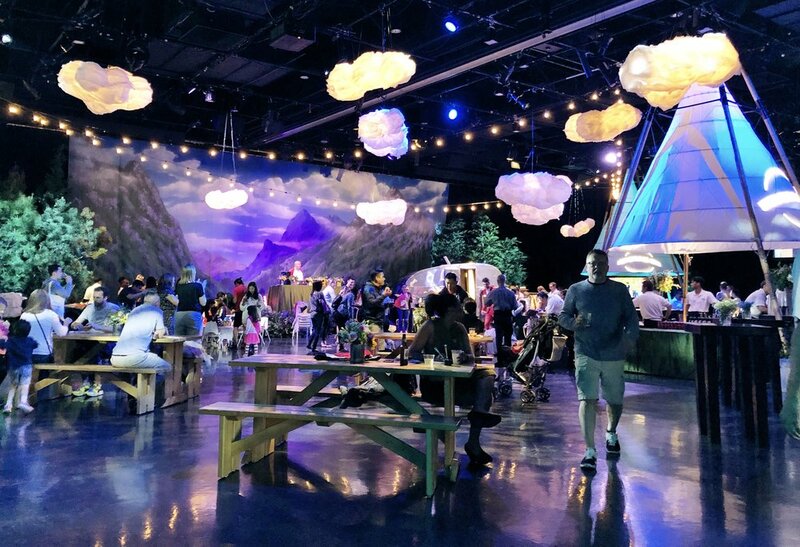 where guests can take photos of such things as giant poop emojis, A Fort Nite screen, a flower hall, a noodle hallway, an Instagram rainbow wall, a mirror infinity room and everyone’s favorite— A MEGA sized Fruit Loop Swimming Pool, er, bowl, among other fun experiences. pictures from our impromptu family night out. Benny and Toby had a blast and well, Paul did too. Enjoy Italian Ice with the Fam Bam! The truth is, after a terribly hectic month of July, I hadn't given myself an opportunity to do things I love–– like hang out with the boys at Disneyland or check out a new museum exhibit or walk around the Third Street Promenade in Santa Monica. Luckily, I had the opportunity to partner with Philly-based Luigi's Real Italian Ice, who's currently in Santa Monica promoting their awesome flavors with a Pop-Up vending machine and super cool activation! The invitation was to visit the Third Street Promenade and bring awareness to their awesome Italian Ice! By the way, Italian Ice was actually created in the U.S. (not Italy). It's known as "water ice" in Philadelphia and shares similarities with American sherbet since it has no dairy or egg ingredients. On Friday, Luigi's Real Italian Ice offered complimentary refreshing ice cups in three different flavors: Strawberry, Mango and Lemon. They're currently available at your local Ralph's store. Benny and Toby couldn't get enough! The boys and I sampled all flavors, spun a prize wheel (which got us coupons for a free box of Luigi's Real Italian Ice cups currently available at your local Ralph's) and the little guys even got temporary tattoos. Most importantly, we learned Luigi's Real Italian Ice is vegan, gluten-free, low sugar and it's also made with real fruit juice... which makes me happy. They'll be at Santa Monica Place (next to the Disney store) this entire weekend. If you can't make it out to Santa Monica Place and "Tweet for a Treat" to redeem a refreshing sample cup of Luigi's Italian Ice, I've got good news: they'll be in San Diego at the Gaslamp District next weekend! Enjoy Friends and Thanks for reading!